The Volkswagen Golf is a fun car to drive but Volkswagen wanted to step it up a notch. Volkswagen crafted the Volkswagen Golf R to be a high performing hatch for driving lovers. The Volkswagen Golf R was designed to deliver an exhilarating driving experience every time drivers get behind the wheel. The body design was meticulously crafted to be aerodynamic to help the Golf R zip through the wind on the city or the highway. When you put your foot on the gas and go, the Golf R can go from 0-60 in under 5 seconds. Ready, Set, Golf R.
Here at McMinnville Volkswagen, our number one priority is our customers leaving our lot behind the wheel of a Volkswagen model they will love to drive for years to come. Each new Volkswagen model comes with The People First Warranty which is a 6-year/72,000-mile warranty. Not to mention it is one of the longest warranties among the competition. Read all about Volkswagen Golf R below. 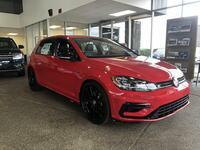 If you have any questions regarding the 2018 Volkswagen Golf R Feel free to contact our sales here Hansel Volkswagen. If you are ready to get behind the wheel of the Golf R schedule a test drive online!